Looking to rent appliances? You’re not alone. Over the years thousands of individuals have found Appliance Warehouse of America to be their source to rent appliances and handle their in-home laundry needs. When you consider the benefits of a full service appliance rental, it is clear why you would rent a washer and dryer as an affordable and effective alternative to owning a set of your own. Whether you’re looking to rent a washer, rent a clothes dryer, or rent a washer and dryer, you’re sure to find it here, at Appliance Warehouse. 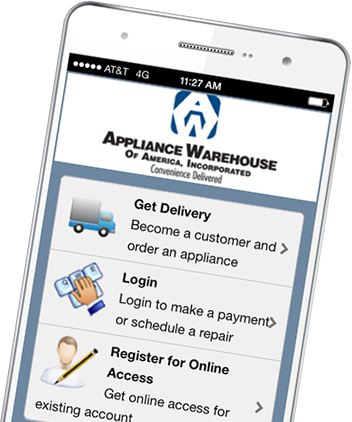 With a simple click above you can rent the appliance your looking for today! If you are an apartment community looking to rent appliances call us today at 800-693-4343 for a program customized to meet your needs. If you are an individual looking to rent appliances, please call or click above to order your washer and dryer today.